Wizkid was part of an all star meeting in Congo Brazzaville, alongside Davido and American singer, Ne-Yo for Akon's "Lighting Africa" project. 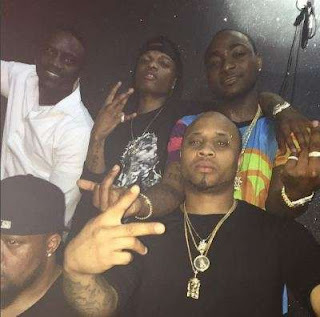 The stars had a swell time in a club as they prepare for a mega concert at the Stade de la Concorde in Congo. The "Lighting Africa" project is an initiative aimed at providing Africa with the platforms to generate more electricity in the continent. Electricity remains one of Africa's major problem, posing great challenge for companies who have to rely on privately owned power source.